A private investigator tries to verify the authenticity of a snuff movie. 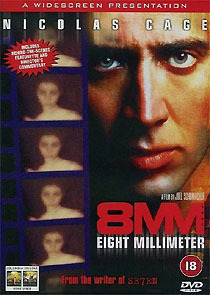 When a wealthy widow finds what appears to be a snuff movie among her husband’s effects, she hires a private investigator, (Nicolas Cage, whose twitchy performance comes close to curdling the movie), in the hope of disproving its authenticity. Schumacher delves deep – but not deep enough – into the murky world of underground video, but never really has the balls to carry through in the same way that, for example, David Fincher would have done. The Fincher reference, incidentally, is no stretch, since Andrew Kevin Walker wrote 8mm’s script. (You’ll note that the front of the disc says “From the writer of Se7en”, not “From the director of Batman and Robin”!) The film has some engaging sequences, especially when Gladiator's Joquin Phoenix and The Sopranos’ James Gandolfini turn up, but is terribly let down by a formulaic ending. Columbia’s disc is outstanding. The film is presented in widescreen ration (2.35:1) with expansive Dolby 5.1 sound, and is often very atmospheric. The film is supported by a commentary track from Schumacher, a trailer, a five-minute featurette and an array of cast filmographies.